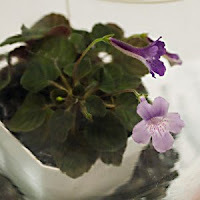 The National Capital Area Chapter of The Gesneriad Society: Class 6 - other flowering tuberous New World with leaves <1"
Class 6 - other flowering tuberous New World with leaves <1"
Entry No. 283, Sinningia pusilla 'White Sprite', exhibited by Paul Susi. Score: 94. First Place. Entry No. 251, Sinningia 'Little Tiger', exhibited by Nancy Kast. Score: 93. Second Place. Entry No. 282, Sinningia pusilla, exhibited by Paul Susi. Score: 84. Third Place.